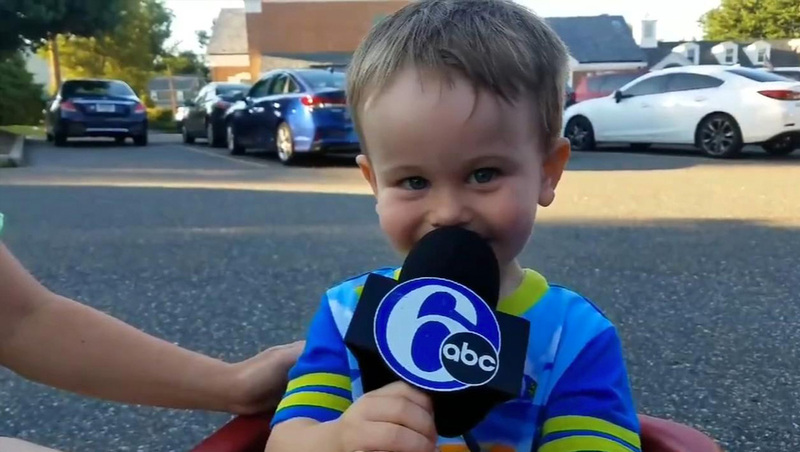 While some viewers just can’t take the “sounds” of a newscast — at least one young fan of WPVI in Philadelphia loves them. Two-year-old Cameron Caputo was ecstatic to see one of the station’s “Action News” vans when he was out with his family — and wanted to show off that he could “sing” the station’s iconic “Move Closer to Your World” news music, which dates back to 1972. Videographer Mike Niklauski captured the performance — complete with a 6ABC mic flag that was almost as big as Cameron’s head. Ironically, another version of “Move Closer to Your World” caused some viewer complaints — and reenactments — just a few hours north of Philadelphia. WNEP in Scranton/Wilkes-Barre, Pennsylvania, uses the so-called “dance version” of the song — and one viewer called in to the station’s feedback line to complain about the “da da da da da” that the station plays. Another viewer, upset that her other calls don’t get used treated the line to a reenactment of the reenactment with more “da da da da da”s. Going back to young Cameron, it’s worth noting the significance of a two-year-old being able to recall a local TV station’s theme song — and shows that, at least for him, news music does exactly what it’s meant to do — become a unforgettable, instantly recognizable branding element.